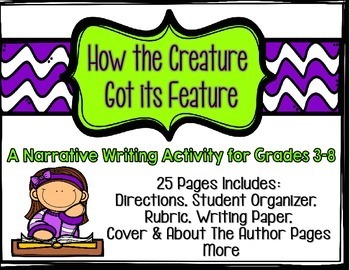 This creative writing resource (narrative) requires students to write an original story explaining how the animal/creature of their choice got its special feature. For example, they might choose to write about how the zebra got its stripes or how elephant got its long trunk. 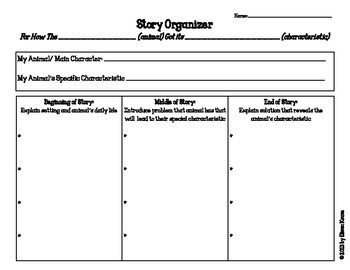 With organizers for student ideas and an original story to use as an example, there is a lot to support the teacher and students. 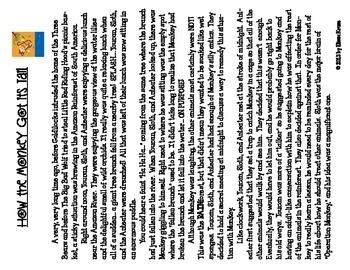 Pages are engaging and include graphics. Everything is general enough that it could be used across a wide range of grades, from elementary to middle school. Once all of the stories are complete, you can use the included pages to create individual student books or a class book. There are many ways that this can be used. It could be a whole class activity, where everyone participates in writing the same story with the teacher. 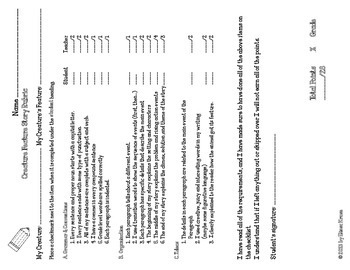 It could be done in pairs or groups, or it can be done individually by students. Get this resource, How the Creature Got its Feature, and two more creative writing resources at a discounted bundle price. It's only $5.00 for all three!